As you hop off of the train and leave JR (Japan Rail) Station in Akihabara, Tokyo, Japan you get the sense that this district is a hot-spot of everything Japanese pop culture. From anime to manga, maid cafes to cat cafes, this place can hold a lot of strange things in one area. One thing as a idol fan that sticks out most to you is the fact is that this part of town is really known for one thing, AKB48. As soon as you step foot outside the station, it becomes very evident that this group is huge even after 10 years. You see the Cafe & Shop, where you can purchase meals that are member inspired and purchase goods related to your oshimen. You also may know that Akihabara is known for the Don Quixote building which houses the AKB48 Theater. Over the course of time, AKB48 has seen its fair share of competition. One group that you might bring to mind is Nogizaka46. They were labeled as a rival idol group but were started by the same man. Strange, huh? There has been the groups from Hello Project that still throw out groups like a crazy factory and produce some amazing songs. Then you have the indie idols that perform in Akiba as well, such as Aoyama St. Hachamecha High School or Akibushu Project. Both those groups are simply amazing. Recently, at least in the past five years, one group has been pushing themselves harder and harder to get to the mainstream and challenge the 48 group. That becomes ever so apparent nearby the 48 Cafe & Shop. If you look up and to the right of the cafe on a plain gray wall, is a gigantic billboard with this group on it, that you can't help but scratch your head at. Why do these members have 70s era hockey, Friday the 13th Jason Vorhees masks on? In the recent idol explosion in Japan over the past few years, many groups have resorted to new ideas in order to buck the norm in idol culture. A few examples include, the social idol group notall, in which I was fortunate to have a interview with them last year, where their fans are allowed to be content creators, from the outfits they wear to writing a song with the members, they have pushed the boundaries of idol groups. You may have heard of a fantastic idol group called BABYMETAL. They started as only a sub-unit of a greater group Sakura Gakuin, that said they performed a thing called Kawaii Metal, or Cute Metal in English. They became pretty big in Japan and a couple of years ago were spotlighted around the world via FineBrothers Entertainment on YouTube. They have rode the fact that they perform that type of music to the point where they are now sort of a metal group. They are extremely popular due to the fusion music they produced as younglings in Amuse. Some other groups that have used and still use fantastic models for broadening the horizon are Ladybaby, in which a grown Australian man, who also happens to be a professional wrestler, growls at audiences and performs in a maid outfit while singing hard rock with two gravure idols. One last instance I will use is the adorable group, Death Rabbits. 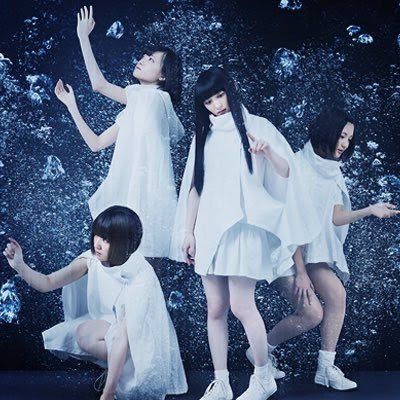 This group has come a long way since debut in which they call their type of music Kawaii Death Pop. The three members are accompanied by a 30 – something year old man that yells at audiences and wears a full on combat uniform, even equipped with a gas mask. As you stare at the sign on the wall, you see a map leading you to where they perform. You follow the map to the best of your knowledge and maybe get lost a couple of times because you expect it to stand out. In a inconspicuous building that has no frills whatsoever, named Pasela Resorts, you might think you may have the wrong building. When you think of the term resort you refer to a hotel. What Pasela Resorts are is a karaoke entertainment complex. You can do all sorts of karaoke that you want. Anyways, inside this building, this masked unit performs 365 days a year, 366 on a leap year. The units name is Kamen Joshi or Masked Women. Starting as a very independent idol group founded by Kleeblat under Alice Project in 2010, Kamen Joshi has sprung up to be a big dog in the industry. The sheer number of members as a part of this group should blow your mind, 18 members, yet that doesn't compare to their competition, AKB48 with over 200 members total. The 18 members are formed from three sub units, Alice Juban or Alice No. 10, Steam Girls and Armor Girls. The members sometimes participate in Gravure shoots and a couple of current members have DVDs out there for sale if you want to buy them (Kubota Misa and Kamiya Erina). Also, not only are the members a part of Kamen Joshi and their large sub-units, but each member is a part of a few other units that perform as well. They have a lot on their plate for being idols. In November 2015, Kamen Joshi put on a one-man live at the Super Saitama Arena in front of thousands of adoring fans. The SSA is a huge venue to play in. I can only think of BABYMETAL who performed in that venue but there have been countless others. I just recently bought the DVD so I'll watch it when I get back to the states. Anyways, they put on a fantastic show. It was a show for the ages and I don't think any of the fans or members will forget that evening. *Note: All the pictures will be of them in the masks but behind those masks, they are actually very pretty. 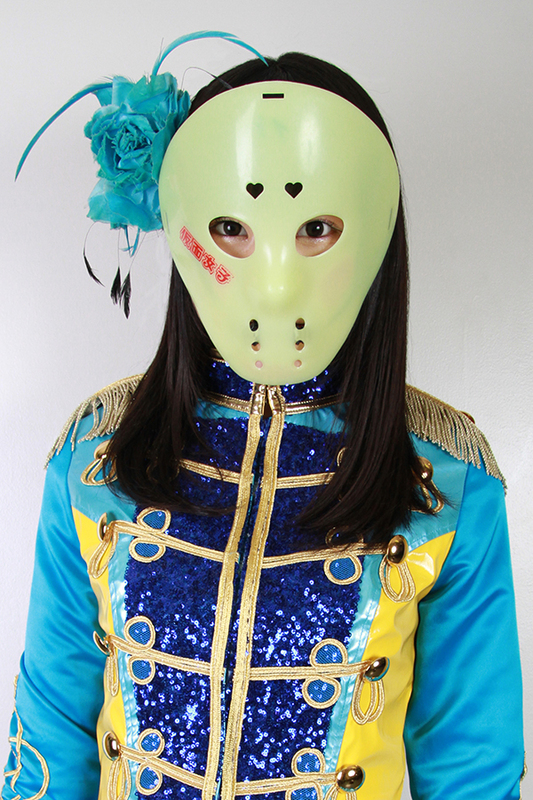 As Kamen Joshi, all but technically two people where the glow-in-the-dark masks. 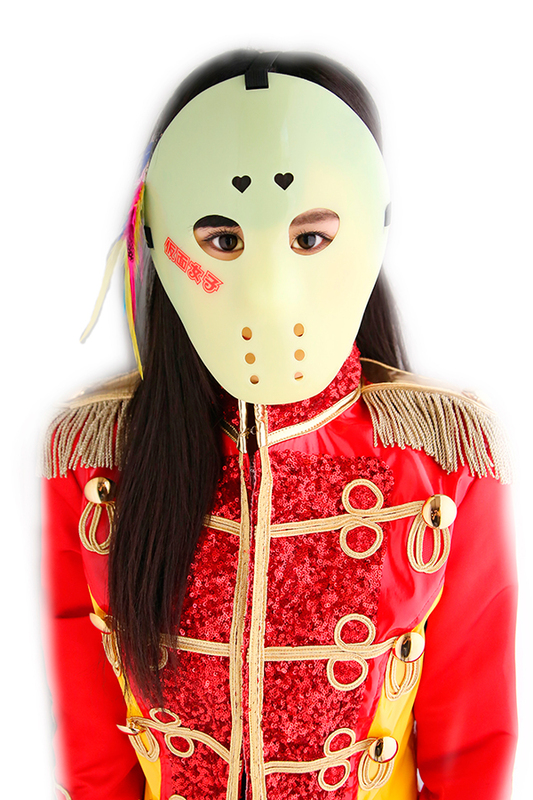 The center of the group, Tachibana Anna wears a dark red mask which draws the attention to her on occasion. 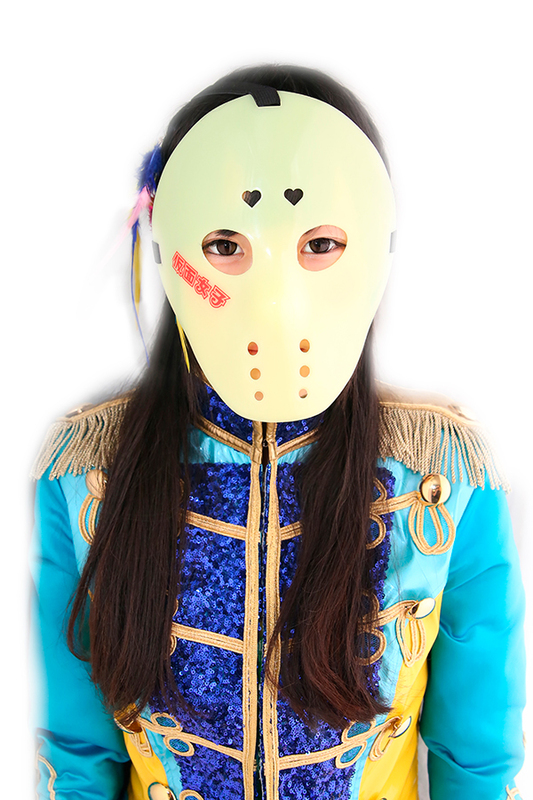 Anna-chan wears that mask as part of the sub-unit Alice Juban along with Nodoka Sakura, Kawamura Nanaka, Sawada Risa, Mori Kanon, and Sakura Yuuki. The five just recently mentioned wear the plain mask when performing. The Steam Girls consist of Kamiya Erina, Kurose Sara, Sakamoto Mana, Mizusawa Mai, Kojima Yuuka, and on a typical performance day they may wear, now only during their entrance or overture, a gas mask. Also, the other instance of using a different mask is Mizusawa Mai. 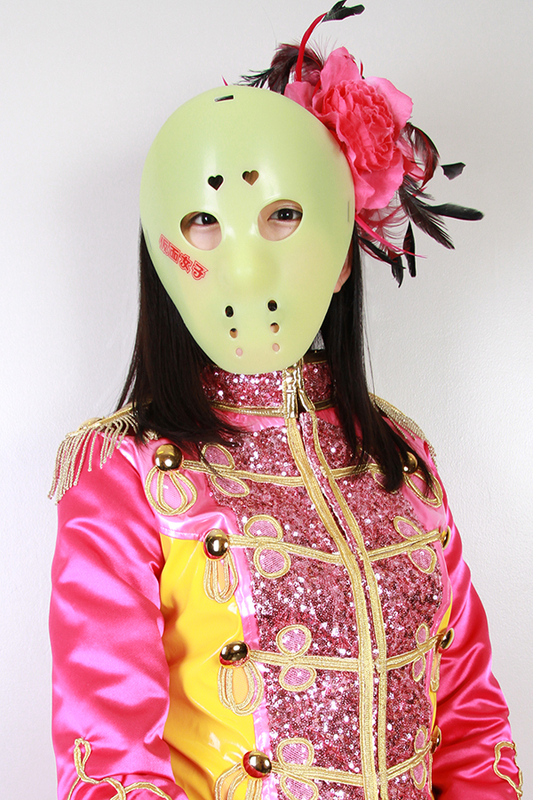 If Anna-chan is out somewhere or performing elsewhere, she will don the mask but in the color pink. They might sound creepy at first when you see them but after they take the masks off, it becomes a whole different ballgame. When I was writing this introduction to the group, Steam Girls and Kamen Joshi member Ume Koume graduated from the group due to personal reasons. I wish her the best of luck in the future. As for the Armor Girls, there are currently six members: Tsukino Moa, Kubota Misa, Hitome Momose, Kitamura Maki, Kusunoki Mayu and Kuroki Hinako. When I glanced over their names, I had no idea that they all began with the letter M and it blew my mind. Just like the Steam Girls, the Armor Girls adopt a iron mask that resembles a knight when he goes jousting. They are pretty cool masks to be honest. 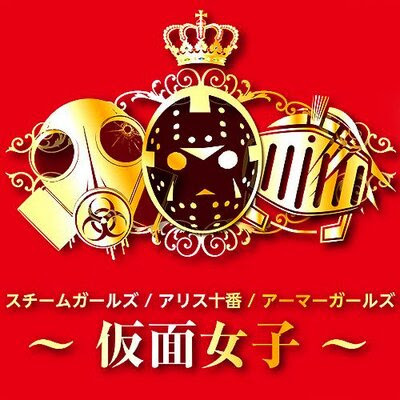 Earlier I mentioned these three groups came together and created the now famous, horror movie, panic inducing masked idol unit Kamen Joshi. 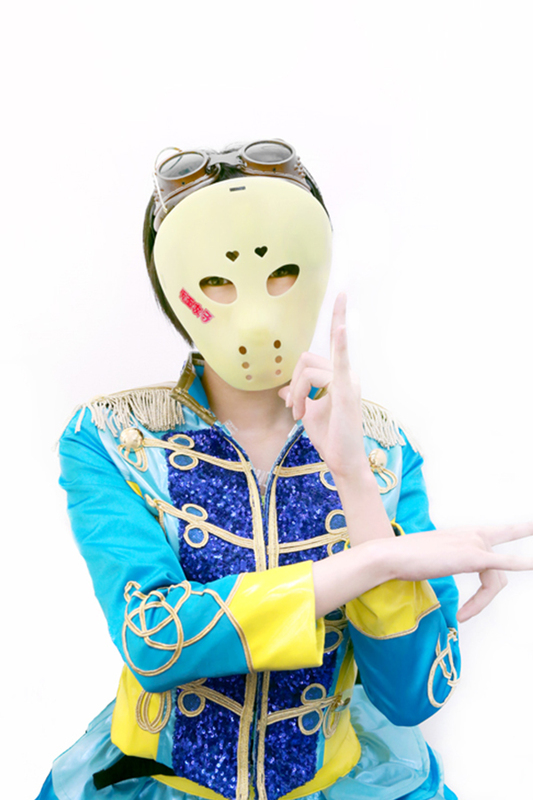 As girls of their generation were constantly appearing on variety TV shows and such, Kamen Joshi kept performing while wearing those eerie masks, which they can never be seen as cute by any means on their faces. The girls turned their frustrations that they may have had or are currently having into all-out performances with the masks they hide their faces under. It gives them all sorts of power which draws in fans from around the world. Now what kind of music would you expect this kind of group to perform you ask? Their original music consists of mostly rock and rap. The rock is very head bang inducing. Warning, might give you a headache. The rap gets you really pumped up in between the intensity of the song. The rappers currently are Nanaka Kawamura and Sakura Yuki whom both belong to the group Alice Juban. Their raps are really good to listen to if you like rap. As you can see this group has a lot of talent in it and never fails to show it on a daily basis. Hey, Tyler. You did a AKB48 article and a Nogizaka 46 article and now you're doing a Kamen Joshi article? I know you like them. Why did it take you so long? Well to answer my own personal thoughts, I knew there had to be a right to to write about them. I had to prepare myself for a pretty big fight in terms of my writing style and how I wanted it to be presented to the public. So, a few months ago, I took a chance about asking for a interview with Kamen Joshi. I sent out a lovely email and I got a quick response with a shocking result. It was a firm, yes. I had been waiting for this interview for the longest time and it finally came time to do it on May 2nd, 2016. That date also happened to be Steam Girls member Mizusawa Mai and my birthday. A very strange coincidence. For the interview I expected to be able to interview all of Kamen Joshi but due to schedule obligations and time constraints, I was only able to get a chance to interview Mizusawa Mai and the Armor Girls. I really feel like that was the best decision ever. I asked a total of 21 questions to both parties, group and personal, which turned into a real fun time. I allowed them to ask questions of myself. I received the most questions from the Armor Girls and I will place those below because I had never heard those questions before. So with that being said, I will start the interview portion with the one I had with Steam Girl Mizusawa Mai. I want to say at first, that some of the questions I had got lost in translation with Mai-chan due to me being a tad bit nervous. So one question got totally omitted from the interview. Q. When you put on those masks (Kamen Joshi) does something change in the way you perform? A. She stated that she feels like a part of the group and more strong. Q. Can you describe the type of music you perform? Q. What is the ultimate goal of the group? Q. What has been the most enjoyable experience of the group? Q. 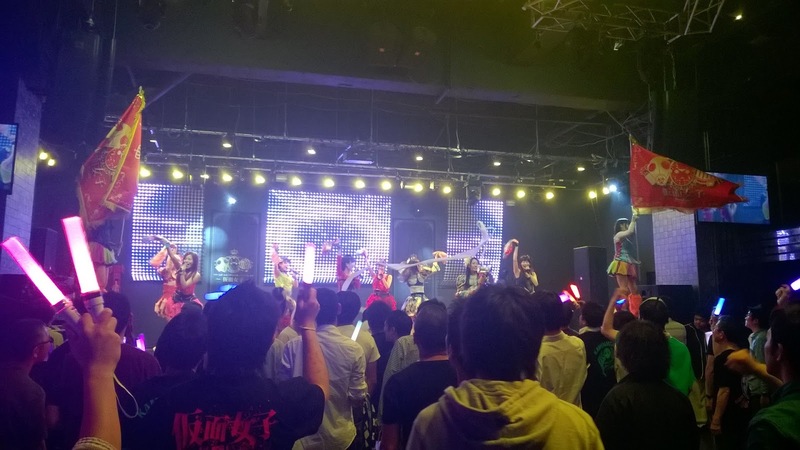 What makes P.A.R.M.S different than the AKB48 Theater? Q. Are there currently any plans to maybe release a new single or even a compilation album in the future? Q. Do you see a performance in the United States happening? If so, where would you want to perform? A. She gladly said that she wants to go to America and the venue of choice for her would be the Apollo Theater in New York City. Q. Is there anything you would like to say to fans that may not know who you are? A. She said she is very nervous but has respect for it. Q. Other than becoming a idol, what is your dream job? A. She stated that she wants to become a fashion model. More importantly the designs that she would want to model for would be One Spot or Liz Lisa, basically Shibuya fashion. Q. What made you want to become a idol? A. When she saw a BOA stage live, that is when she made her decision to become a idol. Q. Describe what being a idol means to you. A. She described about being a idol is that she can deliver power to the audience. Q. What is the best/worst part of being a idol? A. The best part she told me was that it is a fun job yet the worst part about it is keeping her body sharp. Q. You have the Otaku Satisfaction results that come out weekly in which you are ranked by the fans. How important is it to be ranked in the results? A. It is a way for her to be able to know the fans feelings. Q. Who would you say is the most athletic of the group? A. Within a split second, Kawamura Nanaka-chan. Q. Who is the most competitive member of the group? A. The most competitive she said it would have to be Tachibana Anna. Q. What is your favorite song that you have performed? Q. Since you perform so many songs, how difficult is it to remember lyrics or choreography? Q. What is your favorite thing to do when you are feeling down that will cheer you up? A. Her favorite thing is when her mom makes a appearance. Q. What are your favorite musicians to listen to (Japan or Abroad)? A. She likes BOA and also enjoys listening to Chinese lessons while on the road. Interviewers Final Thoughts On That One-On-One: Mizusawa Mai is really pretty in person and it was kind of weird we had the same birthday, but I felt it was like more of a ice breaker than anything. Some of the answers she gave got lost in translation like I mentioned before. The one answer that got me was the Apollo Theater one. The Apollo Theater in NYC is usually home to famous comedians and rappers etc. It would be cool to see a Kamen Joshi concert there just to witness the reaction. One other thing that really got me and it made her laugh was the most athletic question. As soon as she answered, which was pretty quick on the draw, I wrote down the honorific -chan to her name and she pointed it out. Now this one turned into me interviewing four of them at once. So I decided to go in a circle with each question in a clockwise format. I asked a question to one and then the next went to the other, so on and so forth. In that case, I will put down the name of who said what and some times another member chimed in and I will place that there as well. Q. When you put on those masks does anything change in the way you perform? 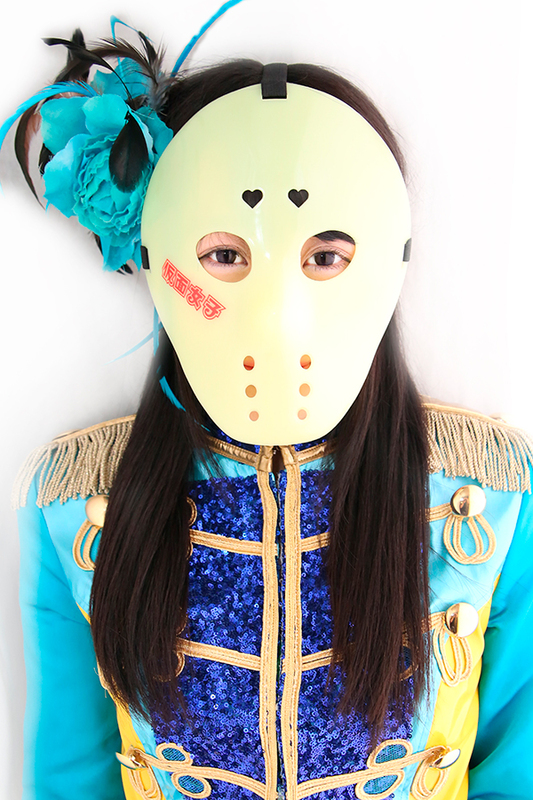 Misa: It makes her feel cool and strong while under the mask she is cute and girlish. Q: Can you describe the type of music you perform? Mayu: She calls the music she performs Half and Half. Kamen Joshis' music is meant to be cool while the Armor Girls are meant to be cute. Q: What is the ultimate goal of the group? Moa: She wants Kamen Joshi to be a national idol group. Q: What has been the most enjoyable experience as a group? Moa: SSA. The group was overwhelmed in so many instances and they overwhelmed as a group in return. All of their emotions became one before and during the performance. All the members had whole hearts and she felt happy to be in Kamen Joshi. Q: Performing at Super Saitama Arena was a pretty big deal, can you explain what kind of emotions were being felt before and after the event? Misa: She felt very nervous and also very confident. She wants to be improved to culture even if she is a underground idol. She also stated that she wants to be joint culture and pursue various dreams. Q: What makes P.A.R.M.S different than the AKB48 Theater? Mayu: They give a free concert every weekend and they are easy to come to which is a difference compared to the 48 Theater. Q: Are there currently any plans to release a new single or compilation album in the future? Momose: No, but she wants to release one but the songs they want to put in there are already being performed in the theater. Q: Do you see a performance in the United States happening? If so, where would you want to perform? Moa: Of course, she gladly responded. She said that she would want to perform at the Sakura Festival in Washington D.C. as it is a huge entertainment competition and they dare to perform there. Q: Is there anything you would like to say to fans that may not know who you really are? Misa: She said that maybe everyone knows about her. Her friends know everything. She doesn't hide her personality. Q: Other than becoming a idol, what is your dream job? Q: What made you want to become a idol? Mayu: She saw Momoiro Clover Z live and gained energy from that event and wanted to emit that energy to fans. Q: Describe what being a idol means to you. Q: What is the best/worst part of being a idol? Moa: The best part she said ware the daily live performances and the chance to meet many people (employee or student), plus the chance to advance her career. The worst part of it is that there is no time to spend with family. She is so busy with being a idol, there is hardly time to spare. Q: You have the Otaku Satisfaction results that come out weekly in which you are ranked by your fans/ How important is it to be ranked? Misa: The system has brought her many fans and salary. Their life and sport is important to her. Q: What were your emotions before and after your debut? Mayu: She had to fill in a big hole in a event with other 10,000 attendees. She was most emotional during the SSA One-Man Live. She felt happiness and emotional after the fact. Q: Who would you say is the most athletic of the group? Q: Who is the most competitive member of the group? Moa: She commented that there is more chance to rank competitively as she has not decided on a select member. She did not want to say herself. Q: What is your favorite song you have performed? Misa: Alice Underground as it contained her first solo part from their first one-man live in Zepp Tokyo in 2014. She also said that they lyrics to the song describe the group itself. Q: Since you perform so many songs, how difficult is it to remember lyrics or choreography? Mayu: The song is Halala and it contains a mixed cloth. They practiced very hard on this song. The song describes Wa Life and it is very difficult to understand because it is hard to explain. Q: What is your favorite thing to do when you are feeling down that will cheer you up? Momose: She says that she just would want to do a good performance and get calls and responses to her. Q: Who are your favorite musicians to listen to (Japan or Abroad)? Interviewers Note: I was really impressed with the answers I was given. They gave me the complete facts about the questions. All four of the members I got to interview were completely patient with me. I wasn't as nervous with them as I was with Mizusawa Mai. After I finished grilling them, I gave them the opportunity to fire back at me and these were some of the questions. Moa: The idol culture in America, what is it like? Tyler: This was the roughest question I have ever received. I had to think long and hard about this one. I gave a long and drawn out answer that would take too much room. In short, I stated that idol culture still hasn't grown a lot here in the states as people don't understand the fans. They ask questions and when the questions get answered they sort of laugh at you like you're a nut job and don't give you a chance to explain. Misa: What is my favorite song? Tyler: I told them my favorite Kamen Joshi song is Zekkai Hero which happens to be a Alice Juban song. I also have favorite songs from the other sub-units. My favorite Armor Girls song would have to be Kokororoido. As for the Steam Girls, my favorite song from them would have to be Seishun Hoseki. My favorite collaboration song would have to be Paradaisui tsu. This song also is my sisters favorite as well. Momose: Who is my oshi? Mayu: What are my favorite groups? Tyler: I gave like a top six as well with Kamen Joshi and notall ranking as number one together. They both were above the 48 groups and both the 46 groups. That was it for the interview portion of the article. I hope you enjoyed reading the interviews and read the rest of this if you have come this far. The story behind me learning of Kamen Joshi can be traced back a little over a year. I saw their video for Gekidane by accident on Facebook. I watched the first 30 seconds and stopped because I really didn't like the type of music. I thought it was to hard rock for me. About two weeks later, I gave it another go around. I instantly liked it and had to find more videos. At that time, I had no idea they were doing daily videos so I didn't pay attention to them. I showed their music videos to friends and family to get feedback and they had no idea what to think. I started to watch the Junketsu (daily video) everyday. Before I went on vacation to Tokyo last year, I found out that a couple of members had been promoted from Pa-Ken and Oz to the Armor Girls, Steam Girls and moved from other groups to Alice Juban. I was super happy to see them succeed. During my vacation there, I had the chance to stop by and watch a performance. I didn't know what to expect. It wasn't Kamen Joshi yet all the sub-units instead. I wrote about this last year. I met Tachibana Anna afterwards because she was my solo oshi at that point. After that day in which I tell stories about, I have not lost track of the group whatsoever. I listen to them constantly. I talk about them constantly. I even have a few friends around me that like them. Kamen Joshi to me is a group that will never get old. The song could be from 4 years ago and you can still jam out to it. I truly, truly love Kamen Joshi and the sub-units!!! When I went for the interview, select members had been out of commission. For Alice Juban, Sakura Yuki and Sawada Risa were not performing on that day yet have made that return a few days ago. The Steam Girls were missing Kurose Sara on that day. As for the Armor Girls, they were missing Kitamura Maki and Kuroki Hinako for this days' performance. As for the whole Kamen Joshi portion of the show, I got a lot of pics but I will share a few of my favorite. I really hoped you enjoyed this article and share it with others as well as start to like the group as well if you haven't yet. I will still be on the lookout for them and cherish this group for a long time to come. I want to thank Mizusawa Mai and the Armor Girls for letting me take their precious time. I know I might have been a goof at some points but I hope you don't hold it against me. I want to thank my translator Ikeda Kouhei. He helped me through the language barrier and allowed this to be more of a fun interview. *And as always, No matter where you are, Have A Fantastic Day! You can follow me on Twitter if you'd like. If you want to discuss this article and share it on Twitter, use #NAIKJ for New Age Idols Kamen Joshi.